S.S.Prorochenko. Root mass accumulation and anti-erosion resistance of soils under meadow grass stands depending on fertilizer. Due to the solid turf due to the accumulation of root mass, perennial herbs improve soil fertility, namely, improve its structure, enrich it with nutrients, protect against erosion. In this case, positive changes in the soil occur due to the interaction of the root system with soil microorganisms, which play an important role in the cycle and plant nutrition. 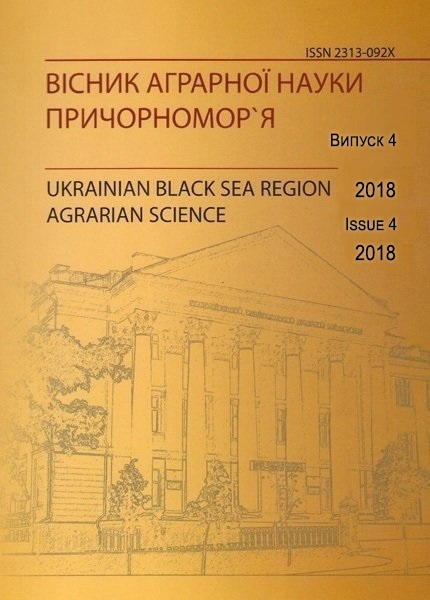 The purpose of the research was to determine the accumulation of root mass and the anti-erosion resistance of the soil under the bright grass fields depending on the fertilization in the conditions of the Right Bank Forest-steppe of Ukraine. According to the approved methodology and the program of the dissertation work, spring flax seeding in 2014 was followed by a three-factor experiment after one-year cereals, namely maize on green fodder. Repetition of experiments – four times. All grass mixtures were fertilized in accordance with the scheme of experiment with the following types of fertilizers: nitrogen – in the form of ammonium nitrate (34% d. P.), Potassium-calimagnesis (26% d. P.), Phosphorus – superphosphate (18.7% d. ), and also introduced a growth stimulator of Phumar in the normal range of 2 liters per hectare, when cereal grasses were in the buccal phase, and alfalfa sown – branching. According to our data (1), the accumulation of dry root mass under investigated multi-year herbage for different fertilizers was in the range from 10.80 to 12.14 t / ha, which is 7.1-7.9 times more than in winter wheat in the phase bush The accumulation of root masses was the most significant increase under the influence of nitrogen fertilizers at a dose of N60 on cereal grass. In this case, against the background of N60Р60К90 compared with the background Р60К90, their dry mass in the 0-20 cm layer of soil increased from 11.01 to 12.14 t / ha or 1.13 t / ha. When this dose is applied to alfalfa or alfalfa grass, the dry weight of the roots has increased from 10.55-11.30 tons / ha to 10.66-11.54 tons / ha or by 0.10-0.34 tons / ha, which is not reliable. With the inclusion of alfalfa sowing to cereals, the mass of dry roots on bezazatnyh backgrounds had only a tendency to increase. It increased in this case by only 0.08-0.47 t / ha with NIR05 0.48 t / ha. On the background of the introduction of N60Р60К90 in alfalfa and alfalfa-cereal grass, compared with cereal herb, the weight of the roots was even lower, but within NIR05. The coefficient of the productive action of the roots as a ratio of dry overground mass to dry mass of roots, depending on the fertilization on different species of grasses, was different. On sown cereal grass he was the smallest and on different backgrounds the fertilizer fluctuated within 0.47-0.63, meanwhile in alfalfa and alfalfa-cereal herbages – within the range of 0.94-1.04, which is 1.7- 2.0 less Under the influence of fertilizers, in particular nitrogen, the coefficient of productive activity of the roots most increased on cereal grass. In this case, against the background of the introduction of N60Р60К90 compared with the background P60K90 in connection with a significant increase in the productivity of the earth’s mass, the coefficient of productivity of the roots increased from 0,50 to 0,63 or 1,3 times, while on alfalfa and alfalfa -largest herbivores, it has changed little and in most cases only tended to increase. Between alfalfa and cereals, including alfalfa herbs on the same fertilizer background, it did not differ significantly. In our studies, 20×20 cm soil monolith with different herbage, taken in the first decade of November with a uniform water jet eroded for 8.30-10.38 minutes, while a monolith of winter wheat, selected in the same time in the buccal phase – for 1 , 08 min, or 7.6-9.6 times faster. The results of the research of Cherkasova V.O. and Kurgak V.G. confirmed that when applying nitrogen fertilizers increases not only productivity, but also anti-erosion resistance of meadow grasses. Thus, when nitrogen was introduced in comparison with the variant without nitrogen, the term for which the soil monolith from the studied grasslands was destroyed under the influence of a jet of water, increased from 8.50-9.40 minutes. up to 9,12-10,37 minutes, or in 1,1 times and little depended on the type of grass. Analysis of the research has shown that not only mineral nitrogen increases the anti-erosion resistance of herbs, but also the symbiotic nitrogen of legumes, due to the inclusion of alfalfa seedlings in cereals. In this case, the duration of the erosion of the monolith increased from 8.87 to 10.04 minutes. up to 9.00-10.37 min by 1-3%. The slightest anti-erosive resistance was characterized by alfalfa seed, which is characterized by a root rod. It is known that herb grass improves soil fertility due to the accumulation of nutrients, in particular nitrogen, phosphorus and potassium, in the roots and root residuals. According to the literature data  in the dry mass of the roots of various types of meadow grasses accumulates from 1.26 to 1.71% of nitrogen, from 0.18 to 0.30% of P2O5 and from 0.78 to 1.15% of K2O. According to our data (Table 2), the nitrogen content in the dry mass of the roots of different types of herbs was accumulated in the range from 1.01 to 1.57%, P2O5 – from 0.19 to 0.25, K2O – from 0.81 to 1.05 . The largest changes in the content of the studied elements in the roots occurred on nitrogen. Its content has increased significantly in the rootstocks of grasses with the dominance of cereals in the introduction of nitrogen fertilizers and the inclusion of alfalfa sowing to cereals, or the use of single-seeded alfalfa crop, especially on bezazatnymi backgrounds. In alfalfa and alfalfa-cereal grass compared with cereal grass, the content of nitrogen in the dry root mass on bezazatnyh phonons (variants without fertilizers R60K90) increased from 1.01-1.03 to 1.25-1.42% or 1.2 -1.4 times, while the background of the introduction of N60Р60К90 – from 1.25 to 1.35-1.57 or 1.1-1.3 times. His greatest content was in alfalfa herbage. In the sown cereal grass from the introduction of fertilizer nitrogen, the content of nitrogen in the dry root increased from 1.03 to 1.25% or 0.22%, while at alfalfa and alfalfa-cereal grass from 1.25-1.40 to 1 , 35-1.57% or 0.10-0.17%. The content of phosphorus and potassium in the roots, depending on the composition of herbs naturally did not change. But the background of the introduction of N60Р60К90 compared to the background Р60К90 observed reduction of these elements at the root. In this case, phosphorus decreased by 0,02-0,03%, and potassium – by 0,08-, 24%. It is known that legumes and bean-cereal grasses improve the soil fertility due to the accumulation of their symbiotic nitrogen. According to our data (Table 3), the largest amount of symbiotic nitrogen in the aboveground and underground masses, on average, in 2014-2016, was accumulated on the bezazatnyh phonograms of alfalfa and alfalfa grasses. The aforementioned grasslands, on average, accumulated over three years of use in an overground and underground mass within the limits of 122-246 kg / ha. On bezazatnyh backgrounds (variants without fertilizers and background P60K90) of the symbiotic nitrogen accumulated 213-246 kg / ha, while at the background of the introduction of N60Р60К90 – 122-165 kg / ha. On the background with the introduction of nitrogen fertilizers in comparison with the nitrogen background it was accumulated in 1,4-1,7 times less. In between bean-cereal grasses, the largest amount of symbiotic nitrogen was accumulated in the alfalfa-cereal grass in the composition of alfalfa crop + stoichon cordless + perianth perennial. According to our data, the bulk of the symbiotic nitrogen indicated in Table 6.3 of the alfalfa and alfalfa-cereal grass fields was accumulated in the overlying mass. Here it was accumulated in the range of 101-207 kg / ha, which makes from 11 to 17%. Conclusions and perspectives of further searches in this direction. Under 10-20 g cm of soil in the roots per hectare, 10,80-12,14 dry mass, 141-173 kg of nitrogen, 21-28 kg of P2O5 and 86-117 kg of K2O are accumulated under the bright grass fields in the 0-20 cm layer of soil. Their mass of roots and anti-erosion resistance is 7.1-9.6 times higher than that of winter wheat in the buckling phase. When adding mineral nitrogen in a dose of N60, the accumulation in the roots of dry matter and nitrogen, as well as the anti-erosion resistance of the meadow and, to a large extent, of cereal grasses, increase. Analysis of the research showed that not only mineral nitrogen increases the anti-erosion resistance of herbs, but also the symbiotic nitrogen of legumes, due to the inclusion of alfalfa sowing to cereals. In this case, the duration of the erosion of the monolith increased from 8.87 to 10.04 minutes. up to 9.00-10.37 min by 1-3%. Alfalfa and alfalfa grasses with different cereal components of the grass in the aboveground and underground mass on different backgrounds, fertilizers on average, in the first three years of use, accumulate 122-246 kg / ha of symbiotic nitrogen, including 83-89% – in the overweight. In 1,4-1,7 times it is accumulated on bezazatnymi backgrounds compared with the introduction of it at a dose of N60. Kurhak, V. H. & Lukianets,O. P. (2004). Vplyv typu travostoiu, system udobrennia ta vykorystannia na produktyvnist sukhodilnykh luchnykh uhid pivnichnoho Lisostepu Ukrainy. Zbirnyk naukovykh prats Vinnytskoho DAU, 17, 9-15 [in Ukrainian]. Kurhak, V. H. &Tovstoshkur, V. M. (2010). Vplyv vydovoho skladu ta udobrennia bahatorichnykh travostoiv na pokaznyky rodiuchosti gruntiv. 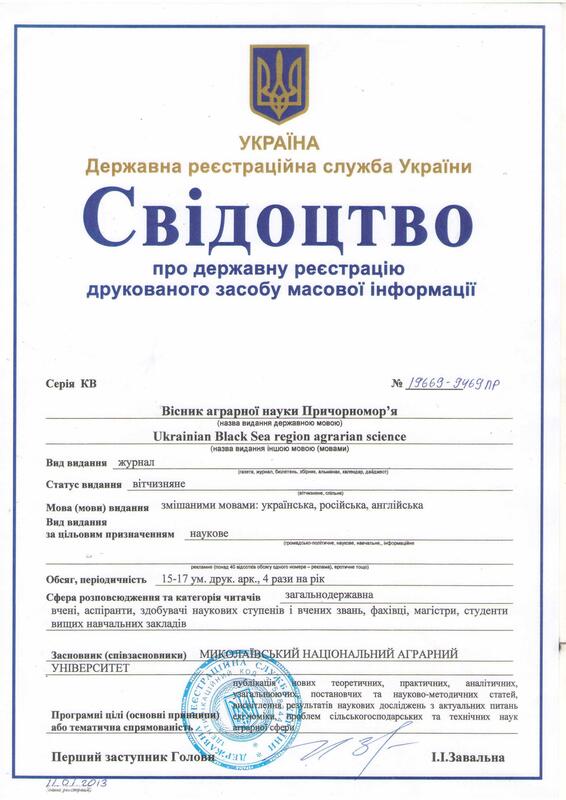 Zbirnyk naukovykh prats NNTs «Instytut zemlerobstva UAAN», 3-4, 15-25 [in Ukrainian]. Kutuzova, A. A. (1986). Nauchnaya osnova ispol’zovaniya biologicheskogo azota v lugovodstve. Vestnik sel’skokhozyaystvennoy nauki, 4, 355, 106-112 [in Russian]. Sau A. (1983). Intensivnost’ pochvoobrazovatel’nogo protsessa pod mnogoletnimi travami Trudy Estonskoy sel’skokhozyaystvennoy akademii, 140, 27-44 [in Russian]. Kurhak V. H. (1995). Ekoloho-biolohichni i ahrotekhnichni osnovy stvorennia vysokoproduktyvnykh siianykh luk v Lisostepu Ukrainy. Extended abstract of candidate’s thesis. Kyiv [in Ukrainian]. Cherkasova, V. A. (1976). Osvoenie sklonov pod pastbishcha i senokosy. Moskva: Kolos [in Russian]. Lukianets, O. P. (2003). Formuvannia luchnykh travostoiv na ornykh zemliakh. Visnyk ahrarnoi nauky, 12, 76-79 [in Ukrainian]. This entry was posted in , №4(100)2018 and tagged С. С. Пророченко. Bookmark the permalink.